H.G.Muller wrote: A new version has been pushed to http://hgm.nubati.net/WinBoard-4.5TM.exe . With a bit of luck this should be the definitive 4.6.0 version. But we have become a bit careful now, and want to expose it to some testing before officially releasing it. So this is the version of the 'developer release' that will take place at GNU later today. (That of yesterday had already turned up so many problems with XBoard, due to switching on the internationalization, that we decided to do a new one today!) The official 4.6.0 release should then follow in one or two weeks, and hopefully not comprise more than changing the version number. The long-awaited official release of XBoard 4.6.0 (formerly available as beta version under the name 4.5TM) has finally taken place! The sources are available from the GNU Savannah website as tar ball from their download section. I prepared a binary installer for WinBoard; for those who want to test it: it is already available from http://hgm.nubati.net/WinBoard-4.6.0.exe . Tomorrow I will create a page for it in the download section of WinBoard forum. For those that are still using 4.5.3, and have not experimented with the TM version: there is a page listing and explaining the new features at the GNU website, http://www.gnu.org/software/xboard/whats_new/portal.html . is this have adopter ? @divya.batra45 wrote: is this have adopter ? This installer contains all essential support programs, such as Polyglot and timeseal, pre-installed and ready to run. It contains two demo engines, a native WinBoard engine (Fairy-Max 4.8) and a UCI engine (Fruit 2.1). The 4.6.0 installer also contains adapters for running Xiangqi UCI and UCCI engines, and Shogi USI engines, and optional engines for these and other Chess variants. I started a new beta version at http://hgm.nubati.net/WinBoard-4.6beta.zip , which should fix the problem with the browsing for a save file. H.G.Muller wrote: I have uploaded a new WB version to http://hgm.nubati.net/WinBoard-4.6beta.zip . In this version I changed the comboboxes for specifying an engine in the Load Engine and Tournament Options dialogs by listboxes. This seemed to work more naturally to me, especially in combination with the grouping of engines. With comboboxes you had to re-open the combobox all the time; after selecting a group, it would close, and you would have to re-open it before you could see the contents of the group. Also when selecting a number of engines for a tourney, it was annoying that you would have to re-open the combobox, and move to the area where you was selecting engines after every engine. The listboxes could also have some disadvantages, though (like making it less easy to select a name by partially typing it). So I would like to know what people think of this change. A new binary installer, with WinBoard 4.6.1, is now available from WinBoard forum. This is a bug-fix release to 4.6.0, and contains no new features compared to that. This mainly concerns bugs in the new features that were discovered after they were first released in 4.6.0, in particular the Tournament Manager and on-the-fly engine loading. (For a full list, see the GNU website.) Some of the bugs were quite bad, but remarkable enough, not everyone seemed to suffer from them (depending on the library DLLs used for memory allocation). So we strongly recommend an upgrade. - new section: "The large Shogi variants"
H.G.Muller wrote: I put together a package for WinBoard that would not need an installer, but an simply be unzipped in a folder of your choice, and would not affect anything outside that folder. (No menus, no registry.) This especially for people that dislike installers, or people that want to put it on a memory stick that can be pugged into any machine to give you a fully operational WinBoard. The portable install can be downloaded from http://hgm.nubati.net/WinBoard-Portable.zip . - new section: "Switching to a better plot library"
I dont like it. Arena gui is much better than Winboard. dass wrote: I dont like it. Arena gui is much better than Winboard. Every GUI has good things and bad things, I prefer Fritz!!! Winboard is a very good open source GUI. Many thanks to the Winboard team for such a great program. 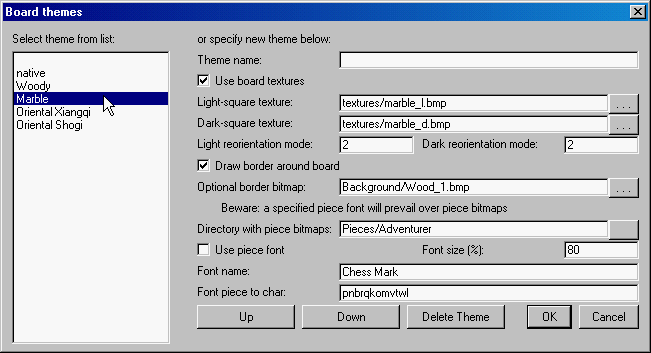 A new menu dialog (View -> Themes) is added, which allows interactive setting of options associated with board textures and piece fonts, which could not be controlled interactively before. It also contains controls for the new border and external piece bitmaps. With the aid of a 'Theme name' field it allows you to define a name for the current combination of piece & board settings. This combination of settings can then late be recalled by clicking it in the listbox, similar to the way you can recall engines with appropriate settings in the Load Engine dialog. For creation of books there is a new menu item 'Create Opening Book'. Clicking it will cause positions from all games from the currently loaded PGN file to be stored in an internal memory buffer, which is then written to disk in Polyglot format (on the file specified as GUI book, so be careful not to overwrite an existing book!). The buffer is never cleared, so repeating the operation with another PGN file will add to it. A second book novelty is the command-line option -mcBookMode. With this option book probing is done not from the external GUI-book file, but from the memory buffer. Moves are selected based on their merit, i.e. the better they score, the more frequently they will be played. 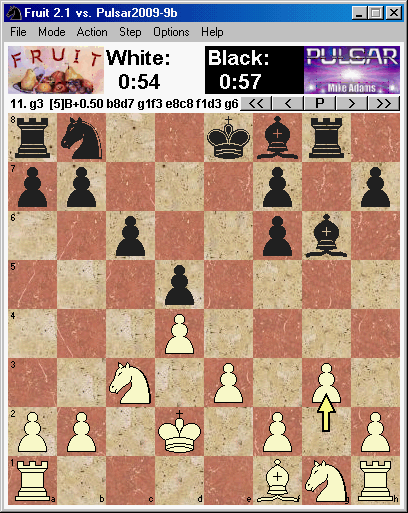 If all moves are played approximately as often as they should, a book miss is reported, so that the engine will pick a move (possibly a new one, which was not in the book yet). All games are added to the memory buffer as soon as they finish. So you can build a book (starting from an arbitrary position) by playing a long match (with a mildly randomizing engine) or tourney of fast games (with many equally strong engines) in this mode. To actually write the book you have to create it from the resulting PGN file; the MC probing mode is just to make sure the PGN has a sensible distribution of opening moves.